irrespective of location rises, the education needed for the digerati, defined loosely as the digital intelligentsia, the whole class of expert digital information professionals, becomes an important area about which all information professionals should stay informed. 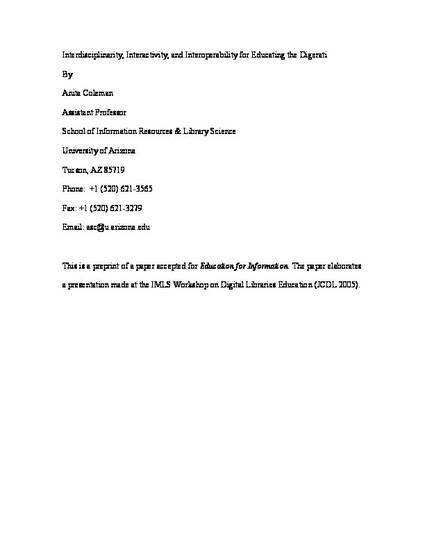 This paper describes the three concepts – interdisciplinarity, interactivity, and interoperability – that are an integral part of digital library research and their use in the curriculum development, teaching, and learning of a specific area of study within Library and Information Science (LIS), namely knowledge organization (KO). KO, studied intellectually, self-referentially, and immersively, it is argued, can provide the foundation for the modern digerati.